Allow students to discover and explore the early 1900s and roaring 1920s in this engaging NO PREP student-centered activity. The website contains historical photo sets with descriptions of topics, audio clips and primary sources. Early finishers can explore videos and primary source accounts to help ensure all levels of learners are served. 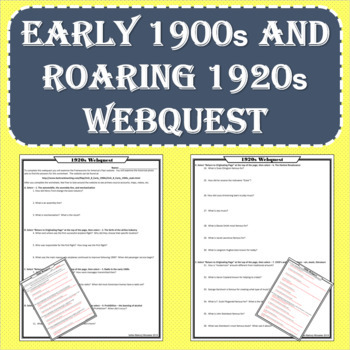 This simple, yet effective, webquest will help to bring the early 1900s and roaring 1920s to life for students of all learning styles. 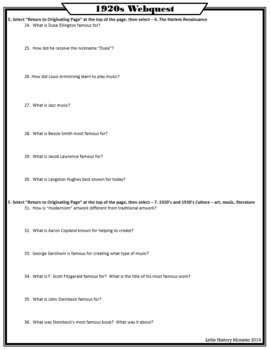 The webquest contains 36 questions. Younger students will probably need two days to complete the activity. 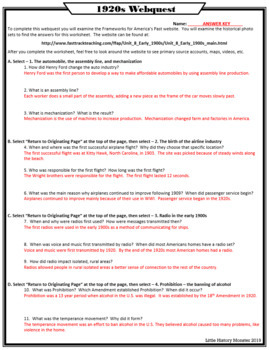 The questions are available in PDF and word format. Word will allow you to send the webquest to students and have them type in the answers. It will also allow you to modify as you see necessary. Please let me know if you have questions or concerns!